A few weeks ago we went to FACTS in Ghent (Belgium) and they had an amazing guest list (again). 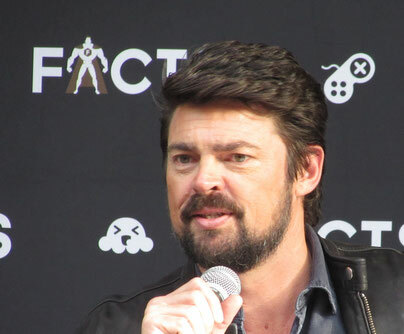 One of the guests was Karl Urban and I was very excited about this announcement. I'm a big fan of the "Lord of the Rings"- trilogy, so I was glad to get a chance to meet the actor behind the character of Éomer. Of course Urban played in a lot of other great movies, but we'll talk more about that later. Since Sigmund and Carola only just got back from New York (Comic Con) they had to pass on this one, but Tristan and I packed our bags for the weekend. We decided to take the train and had to leave home very early. Since the whole trip would take approximately 3 and a half hours we left home around half past 6 a.m. Estimated time of arrival at Flanders Expo was somewhere around 10 o'clock. It all went very smoothly and the train was filled with people in costume (cosplay), also on their way to FACTS. Everything went smoothly up until Aalst (which is situated half an hour from Ghent. The train stopped and soon it became clear that an accident occurred and we would be there for quite some time. (Estimated time of arrival at Flanders Expo: later than expected but hey we had two days to spent so I was pretty optimistic). Time passed on and I think it was around 11 a.m. that we were asked to change trains. 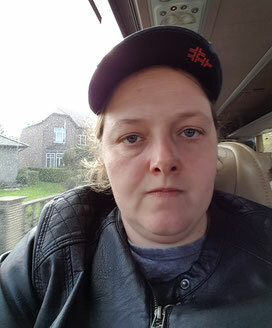 We would go to a place called Schellebelle and there we could transfer onto buses, which would bring us to Ghent. Estimated time of arrival at Flanders Expo: a whole hell of a lot later than expected but at least we were moving. Well we were moving until Schellebelle and then there were hundreds of people and no bus. 20 minutes later still no bus... At that moment my optimism was slowly fading away and great annoyance came in it's place,but wait...a bus! One bus... hundreds of people (and counting,because trains kept on arriving from Aalst). How can I explain what happened next? Think first episode of "The Walking Dead", when Rick is stuck in the tank. Camera zooming out and hundred of walkers walking up to the tank. It was kind of like that, only the tank was a bus and the walkers were people running. Mission Impossible. But hey surely more buses would follow quick, right? Wrong! Estimated time of arrival at Flanders Expo: well let's just say at that moment I was hoping we would get there before sunset. When the next bus arrived 15-20 minutes later the whole thing started over, with the only difference that the bus stopped on the other side of the tracks. By the time we got there the bus was full. Let's just say that eventually we managed to get in a bus and I was mad as hell (as you can see). Apart from the whole waiting thing, we were hungry and thirsty, because we hadn't had anything to eat or drink at all. But from that point things went relatively smooth and we arrived at Flanders Expo at about 1.30 p.m. I already bought my Karl Urban photo op, but luckily I chose to do it on Sunday. So although we lost a lot of time (and sanity), we did not really miss a lot (luckily the Q&A's only started around noon, so I only missed Brent Spiner and I could catch his Q&A on Sunday). Karl-Heinz Urban was born in Wellington (New Zealand) at June 7th, 1972. His father was a German immigrant and owned a leather store and his mother worked for The Film Facilities in Wellington. 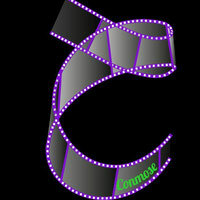 Because of this Urban developed an interest in the film industry. At the age of 8 he had a (one line) role in an episode of the TV show "Pioneer Woman". After this Karl kept on acting on stage in school productions, but he only started acting professionally after high school. He left Wellington University after a year, to pursue his dream of acting. After some years of acting on stage, appearing in TV commercials and moving around he eventually landed recurring roles in "Hercules: The Legendary Journeys" and its spin-off "Xena: Warrior Princess" (as Julius Ceasar/Cupid).His first role in a Hollywood production was the role of Munder in the 2002 horror movie "Ghost Ship" in 2002. Not long after that his big break came, when he landed the role of Éomer of Rohan in "The Lord of the Rings: The Two Towers" and "The Lord of the Rings: Return of the King". Since then Urban played in a lot of high-profile movies, like: "The Bourne Supremacy" (as Kirill, 2004), "The Chronicles of Riddick"(as Vaako, 2004), "Doom" (as John Grimm, 2005), "Star Trek: The Future Begins" (as Bones, 2009), "RED" (as William Cooper, 2010), "Dredd" (as Judge Dredd, 2012), "Star Trek: Into Darkness" (as Bones, 2013), "The Chronicles of Riddick: Rule the Dark"(as Vaako, 2013) and "Star Trek: Beyond" (as Bones, 2016). Recently Urban starred in the new Marvel movie "Thor: Ragnarok" (in cinemas now). He plays the role of the bad guy Skurge. 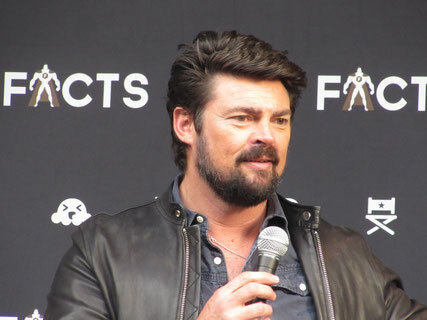 Have I already mentioned that I was very excited about Karl Urban's presence at FACTS? Well I was! I attended both of his Q&A's (Saturday and Sunday) and I had already bought a photo op for the Sunday session. It's always nice to get the chance to attend a panel, before the photo op. Everyone was allowed to take pictures at the Q&A, but only during the first minutes. From the moment the questions started, he preferred the cameras to be stowed away. I really thought this was a great alternative for not being allowed to take pictures at all. I can imagine that the actor or actress on the stage prefers the faces of the people in the room instead of mobile phones and cameras. During his panels Urban talked a lot about his time at the sets of "The Lord of the Rings" and "Star Trek". He talked about the pranks on different sets, his work on "Dredd" and of course he also talked about his new movie "Thor: Ragnarok". During his Saturday panel he even gave away some special tickets for the Belgian premiere of the movie (later that day at FACTS). Are you curious about the things Urban talked about? Keep an eye on our website, because I will write about the panels in a separate article soon. 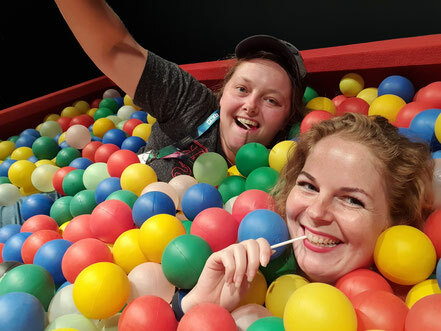 I had a lot of fun in the panels and I was pretty nervous for my photo op (as always). In order to get in line on time I had to leave Brent Spiner's Q&A about 10 minutes before it ended. This was a shame, because Spiner is a pretty funny guy, but it also meant I wasn't in the back of the line for the photo op. The queue moved quickly and Mr. Urban was very nice during the op. 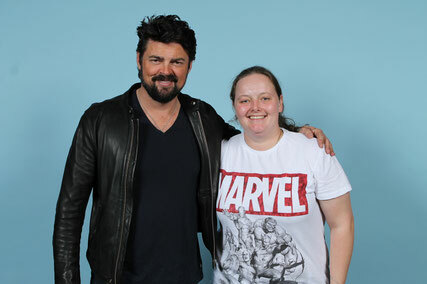 Unfortunately the time during a photo op is very limited, but I am very happy with my picture with Karl Urban and it's a great way to capture the memory.